Adam4Adam.com: Is the highest ranked gay dating site and it has a particularly large user base in the US and UK. This site is strictly for gay men to hook-up. No romantic intentions here and that is made clear once you enter. The site also works as a place for freelance adult industry types to market themselves and make extra cash with web cam shows. All of this is common knowledge to the members. Costs are paid for by adult-oriented advertising, and escorts are not discouraged from signing up. Therefore, Adam4Adam is considered to be an ‘adult’ gay dating site – and an extremely popular one at that. Is a dating site more for hooking up or casual encounters, and the site doesn’t hide it at all. 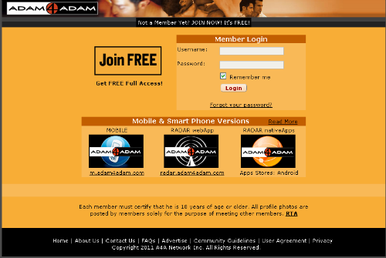 Adam4Adam has a visitor feature, where users who are only temporarily in the area can post looking to meet up. Therefore, you can have both a HOME profile and a visitor profile for when you are on the road and looking to meet up with someone new. Great for work travelers or folks that want to meet someone new outside their normal geographic location. A live webcam option adds a bit of interactivity to the site, but a lot of the gents on the video feeds require payment for you to view them in their entirety. Every one that I saw was incredibly attractive and could easily work as a model. There is also a mobile version of Adam4Adam. Quick and easy to use, it offers most of the same features as the online version, just on your cell phone instead. There are no fees to join Adam4Adam. However, users can make a donation to the site to become an A4 member, which gives them a PRO advertising credit for a gay-related website or to their own profile page. Donations can be given using your credit card, and can also be auto-billed on a regular basis.